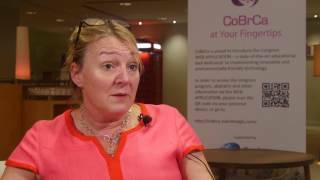 Katy Hogben, MBBS, FRCS, PhD, of Imperial College Healthcare, London, UK discusses the importance of MRI at the 2016 World Congress on Controversies in Breast Cancer (CoBrCa) in Barcelona, Spain. She explains that MRI is a very important tool and we are very lucky to have it in the Western world where it is used extensively. She believes that it is, however, not for every patient. MRI is discussed for every patient in multidisciplinary team meetings as an adjunct to diagnosis in early breast cancer patients.